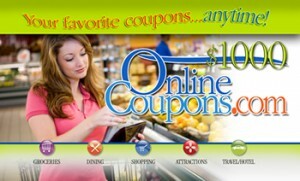 You're Here: Home / Blog / Digital Signage / More in-store money making fun & the new sound of coupons. More in-store money making fun & the new sound of coupons. Remember Catalina? It’s that US marketing company producing instantly customised ads at checkouts in NY supermarkets. They came out with another gimmick and this time are on line coupons, according to The New York Times. The company is already offering check-out coupons, that popular on the other side of the Atlantic that the loyal couponers call themselves ”Catalinas”. These printed check-outs are competing with the mailed ones, the coupons in magazines, newspapers and penny-saver publications all of them missing an important part of the population- the youth and missing the benefits of place- based advertising. The online couponing field is booming; although they represent only 1% of all coupons they make 10% of all redemptions (nice proportion). The advent of on line coupon deals imply that they could become an in-store digital ad subject as anyone is interested in saving money…especially in stores. There’s some potential fun to it if one decides to integrate the two very important digital screens in everybody’s lives nowadays- the in-store one and the mobile phone. Let’s say people miss your deal on websites like coolsavings.com or smartsource.com BUT they are in your venue. Gently bring the online coupons to their attention via your venue’s screen with a message like ”Activate your Bluetooth and get our best deals”. While in the store, this will sound highly appealing. Stores offering club cards (like Tesco) could take the digital signage- mobile phone game one step further by using the NFC technology. Imagine they would have either club cards or NFC enabled phones (like Google Nexus or the new iPhone 5) and a device scanning your chip whenentering their shop. As a client, you’d be immediately identified and after being prompted by screen ads to activate your NFC you’ll receive personalised coupons notifications (about products you’re actually interested in) on your mobile. As Catalina spokesperson puts it ”there’s a fun and engaging element” to it and the coupon’s digital trend can only be benefit digital signage. As she notes, companies are trying to figure out ”how to market in this new (digital) world” and leverage the daily- deal coupons’ urgency and the interruptive nature of digital media. All we could add is: caching ;)!